Diana monkeys are some of the most clever monkeys when it comes to language. We all know the expression monkey see, monkey do. But should the saying really go monkey hear, monkey do? Recent studies are finding that the language abilities of some monkeys are more sophisticated than previously believed. Much more sophisticated. Monkeys live together in social groups. All members contribute by helping to defend food sources, raise young, and watch for predators. But it is impossible to live in a social group without some form of communication. Group members need ways to influence and inform each other. This is what drives language. Monkeys have evolved many ways of communicating, including visual cues, auditory calls, and even some olfactory signals. Some of their visual signals are quite beautiful, like the long, curled tongue of the emperor tamarin, signaling to her mate when she wants to offload her babies. But visual signals only work if they can be seen. In the dense forest and underbrush that most primates live in, auditory cues are a much more powerful tool. Calls and vocalizations can also be modified in pitch, loudness, and duration, which means a vast array of messages can be transmitted. Alarm calls, territorial calls, food calls, personal identification calls, dominance calls — these are the basic messages that primates need to successfully live in groups. But some developed more complex and specialized forms of auditory communication. Some developed language. No animals have all the aspects of human language, but several species have some. Diana monkeys, seen in Clever Monkeys, are some of the most clever monkeys when it comes to language. They combine calls to make sentence-like messages. This requires grammar. The meaning of the “sentence” depends on what sounds are included and in what order. Added sounds convey more information, like “maybe,” or “not urgent.” Each predator has an assigned call. The eagle call differs from the jaguar call, meaning Diana monkey language includes semantics: signals convey meaning and refer to features in the real world. And what’s more impressive is that the Diana monkeys can understand other species of monkeys. 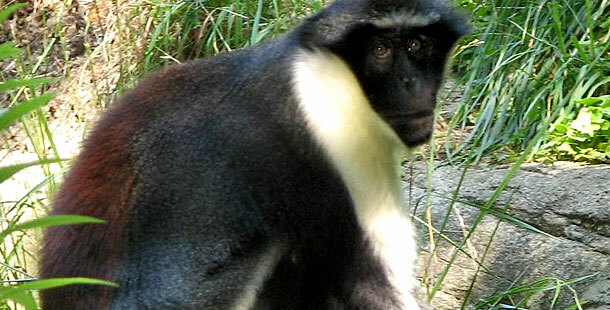 Putty-nosed guenons also combine calls, and their messages can be understood by the Diana monkeys. A remarkable example of multilingual primates is seen in Clever Monkeys, with eight different monkey species living together and listening to each other. With eight times as many eyes on the lookout, it’s much harder for predators to go unnoticed. Each of the eight species has at least 15 distinct calls — that’s 120 different sounds to remember. There aren’t many humans that speak eight different languages. One of the most interesting aspects of human language is the ability to deceive. Some primates are capable of displacement, or the use of language to refer to things that are not present. Monkeys use both spatial displacement, referring to objects that are not present in that space, and temporal displacement, referring to objects that are not present at that time. The white-faced capuchin in Clever Monkeys that uses displacement to deceive his troop had to think abstractly about invisible objects. And he had to predict how others would respond. It takes impressive intelligence to tell a monkey lie. It also takes impressive intelligence to live in very large groups of up to 800 individuals like the geladas of Ethiopia. Within the larger band, gelada males are chosen by females, and they live within harems of females. But staying on top of the social order takes a lot of maneuvering. Most importantly, being a dominant gelada requires a high level of social intelligence and an ability to use visual and auditory signals to communicate. Geladas have over thirty distinct vocalizations. These vocalizations can indicate social status, identity, alarm, friendliness, or submission. Grooming strengthens bonds between group members and brings overall stability to the family unit, but geladas spend most of their day shuffling from spot to spot, picking grass with their thumbs and index fingers. With little time to groom, “chatting” has become a substitute way to relieve tension. This is perhaps what our origins resembled, learning language as we moved across the plains. Photo by Trisha Shears, Creative Commons license. Did you watch “Clever Monkeys”? Tell us what you think!